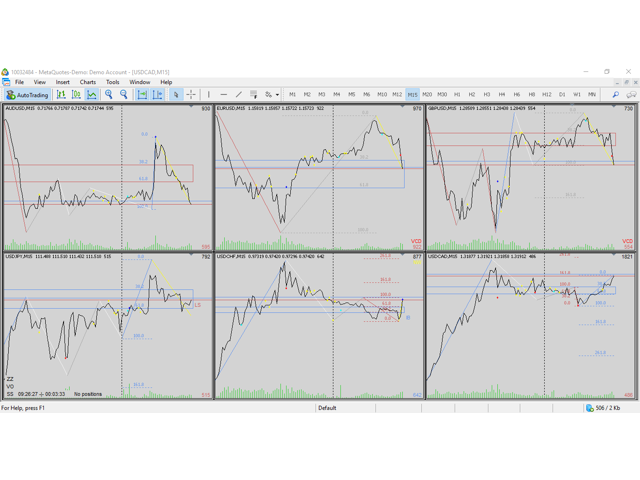 The program allows you to simultaneously view up to 25 charts of trading instruments in one window of the main chart and this approach can be convenient for reviewing and analyzing the current situation when making trading decisions. However, it should be borne in mind that the more graphs will be displayed at a time, the more power from the computer will be required. Please, adequately assess the capabilities of your computer. 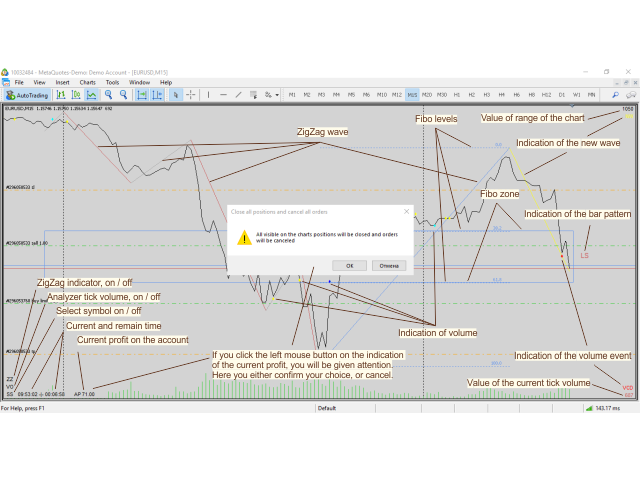 This version of the program is made in the type of "Expert Advisor", in fact it is a utility and it is useless to test in the strategy tester because it does not work with historical data, does not manage trading orders, but only displays the current situation with the selected symbols and issues notifications about events. current account profit with the ability to close all positions. The detector of the main patterns of displays 8 types of patterns (FB - Force Bar, IB - Inside Bar, OB - Outside Bar, DE - Double Extremum, HR - Hook Revers, BP - Breaking Price Revers, PP - Pivot Point Revers, LS - Long Shadow Bar) with a visual and audible signal. The program corresponds to the “Expert Advisor” type. Feature: the demand for computer power increases with increasing number of displayed graphs. When the program is launched for the first time, the symbols of trading instruments are selected from the "Market Overview" of the terminal and automatically assigned to subordinate charts. To select a symbol the and the appointment of its desired schedule, you need to click on the abbreviation "SS" located in the lower left corner of the main chart. A list of available symbols previously activated in the "Market Overview" of the terminal will be opened. Then click on the desired chart and click on the desired symbol. To exit the operation of assigning symbols to the charts, you need to click on the abbreviation "SS", the list of available symbols will be hidden. To turn on the volume analyzer, click on the abbreviation "VO". To turn the Zig-Zag indicator on, click on the abbreviation "ZZ". To close all positions, click on the current profit display. Close all positions and cancel all orders – close all positions and cancel all pending orders on all charts on the current account. Minor change associated with updating the state of objects when an event occurs.